Clearly, the Grumpy Vegan is happy with the food served. Just don't get between him and it. 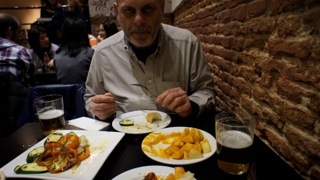 Various projects and a stinker of a cold disrupted the Grumpy Vegan’s commitment to publish fascinating accounts here of what he eats when he travels foreign climes, namely, France and Spain, recently, and, principally here, the latter rather than the former. Fresh fruits and vegetables prepared and cooked simply with basic ingredients helps to keep the Grumpy Vegan, er, happy. So, meals taken out and about often end vegetable-based more than anything else. This is not a complaint. The proverbial British vegan staple of an order of ‘chips and a salad, please’ and, a pint of beer when in a pub, is tough to beat. 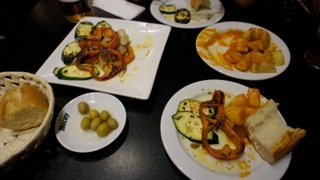 Which is just as well when it comes to such European countries as France, Spain and Italy–particularly the latter two because they know how to offer simply wonderful and wonderfully simple vegetable dishes. There's always a moment of panic between the meal being served and moments later when it's too late to photograph it in all its glory. This is why the dishes in these photos are always partially eaten. 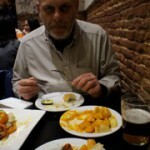 For example, the Grumpy Vegan stumbled across in the historic district of Madrid (Mayor Plaza?) an Italian cafe where such a delicious meal was had. 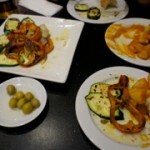 Tapas-style plates of spicy potatoes, mixed grilled vegetables, olives and bread to sop it all up with. What’s not to like? This entry was posted in Eating and tagged Glimpses into the Private Life of the Grumpy Vegan. Bookmark the permalink.